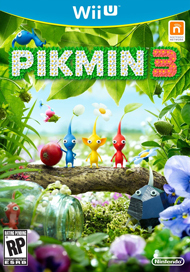 Part adorable adventure, part dark fable, Pikmin 3 stars a trio of intrepid spacefaring adventurers searching for a source of food for their depleted planet. When they crash-land on the mysterious planet PNF-404 (geek joke ahoy), they discover the plantlike creatures called Pikmin that we know and love. 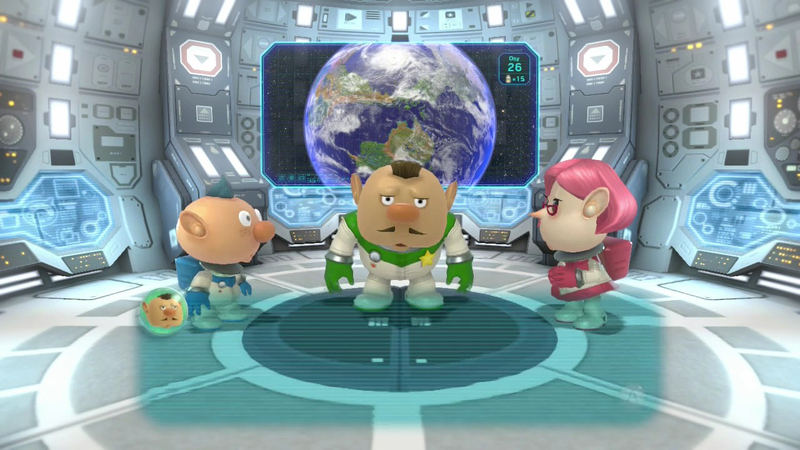 With the help of the Pikmin, Captain Charlie, Botanist Brittany, and Engineer Alph will need to stock up on as much fruit as they can find as well as discover a way to get back home. Featuring addictive genre-defying gameplay and a world that is a feast for the eyes, Pikmin 3 is a game that Wii U owners won't want to miss. PNF-404 is beautiful from the moment you set your eyes on the game's title screen. Nintendo has pulled out all the stops for its first serious HD game, possibly enough to make fans forgive the company for the Wii U's extended dry spell. The planet boasts a multitude of ecosystems bursting with lush foliage, crystalline waters, and strange creatures that are brought to life by impressive textures and lighting effects. It's a place you'd want to reach out and touch if so many of its inhabitants didn't have disgusting, slimy tongues and large, pointed teeth. As usual, the company's animation and sound-effect work is top-notch. Thanks to both, the tiny astronauts and Pikmin are heart-meltingly cute, and the boss monsters you'll encounter in each area are gigantic and menacing. Hearing the death cries of a squad of Pikmin as they're stomped by a monstrosity that looks like a cross between a spider and a kitchen mop makes you feel genuinely bad for putting the little guys in harm's way. 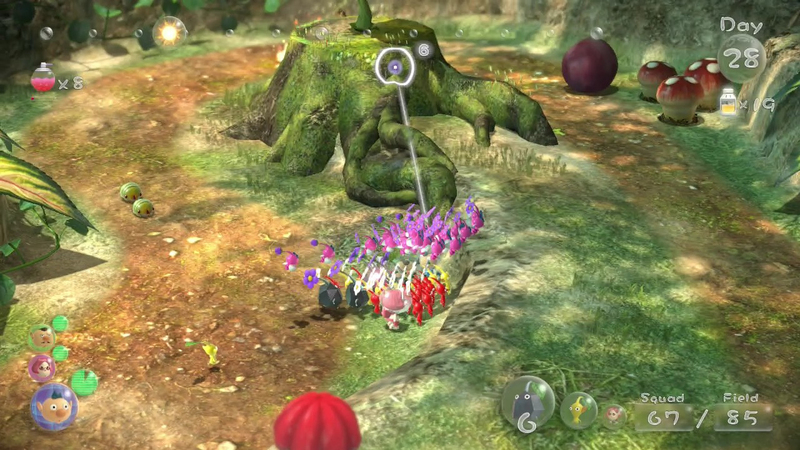 The game's framerate is extremely smooth, which is impressive considering how many moving parts are involved with battles between monsters and squads of one-hundred Pikmin. At its basic level, playing the game involves pressing B to call nearby Pikmin to the currently controlled astronaut, then pressing A to throw the Pikmin at whatever problem (puzzle, obstacle, or enemy) presents itself. 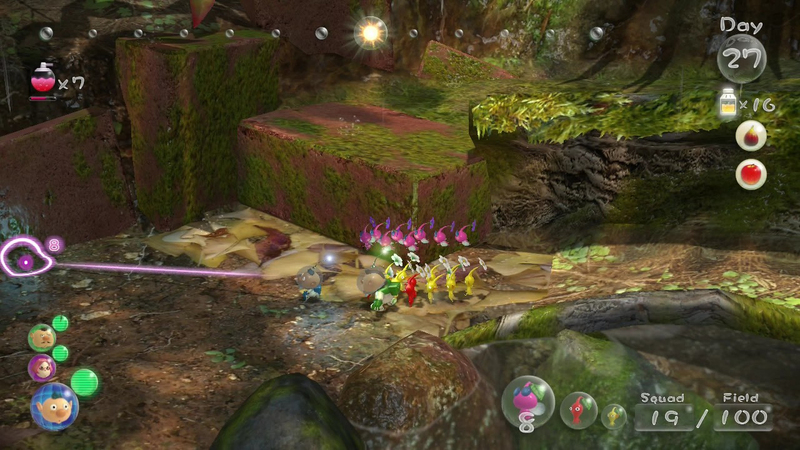 Red, blue, and yellow Pikmin work similarly to previous games, with fire, water, and electric powers respectively. The new rock and flying Pikmin are a lot of fun to play with. Rock Pikmin break hard objects and pack a punch in a fight. Flying Pikmin are used to lift and pull objects off the ground, although, their ability to soar over environmental obstacles can make them difficult to keep track of. 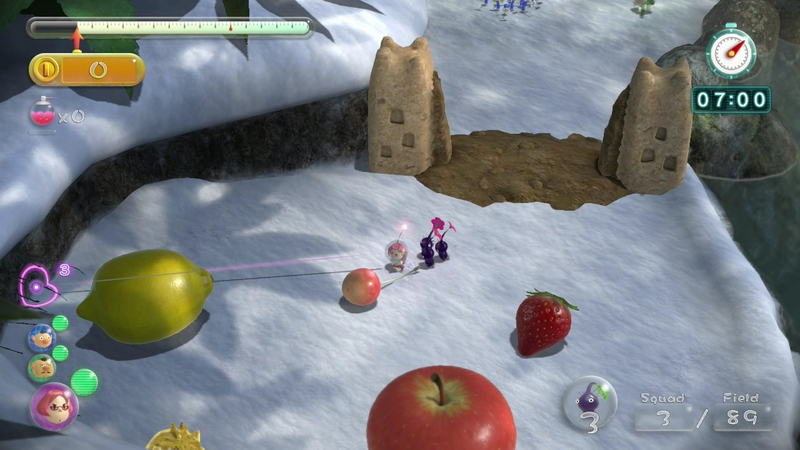 As always, Pikmin will spend a lot of time carrying objects, such as fruit and defeated enemies, back to their home base. 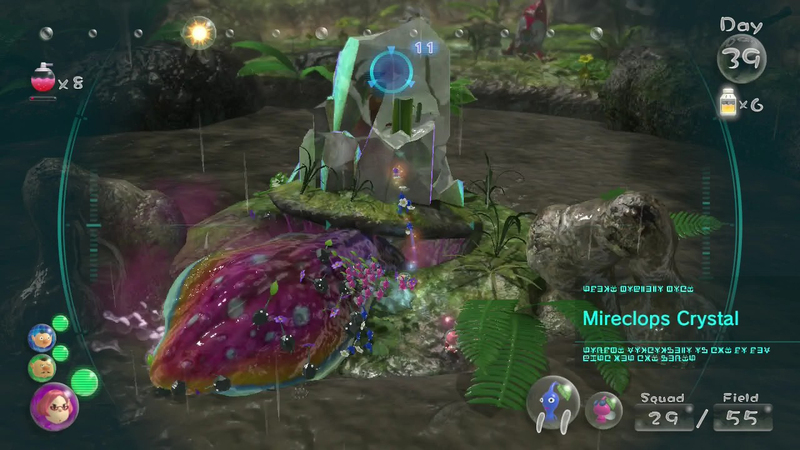 This could become tedious in previous Pikmin games, but Pikmin 3's design ensures that there's always something new and interesting for the player to do. 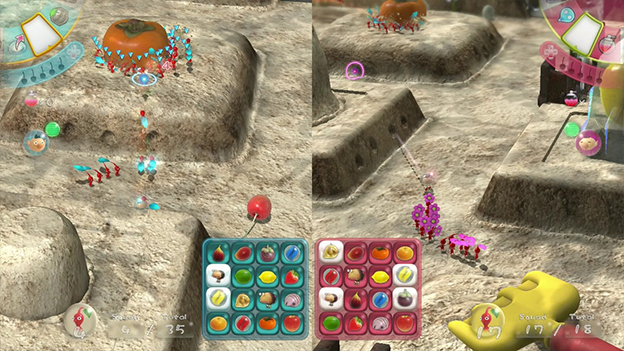 For one thing, the player can use the three astronauts to split the Pikmin into three squads, so one group can explore new territory while another is hauling fruit back to the ship. 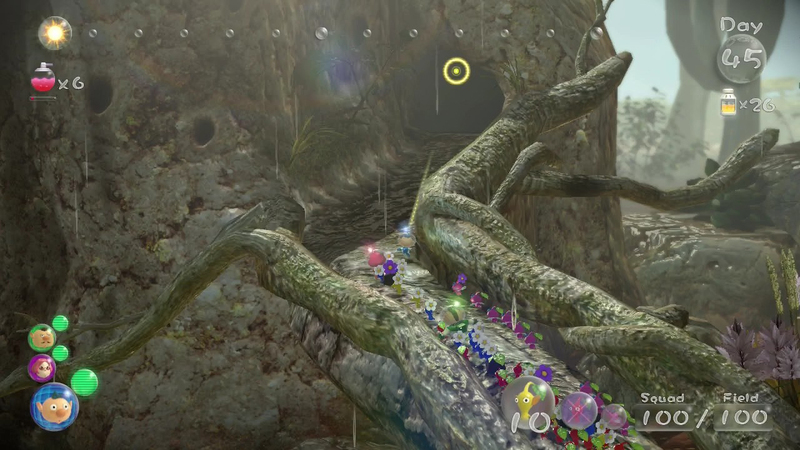 For another, the levels are full of interesting puzzles and novel things to do with the Pikmin. Whether it's digging up bombs, sliding down ice chutes, or hitching a ride on a lily pad, it's a joy to see what puzzles and tools will appear whenever there's a new region to explore. The Pikmin AI is decent as well, though sometimes they'll get stuck on the scenery in a way that makes it difficult to bring them safely back to the herd. 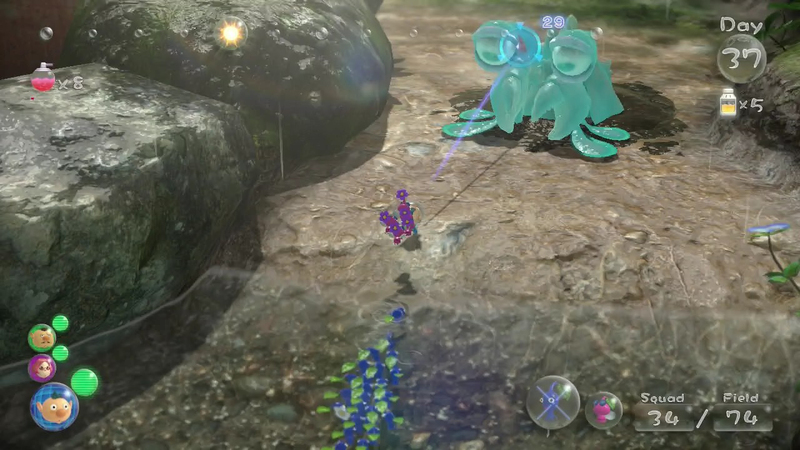 Boss fights are as well designed as the rest of the game and require more strategy than the traditional Pikmin hit-and-run combat. There's a certain amount of that involved, but each major boss also has a unique setup that requires the player to make use of the environment found in the area. Brains are more important than brawn or even good reflexes; this goes for the entire game. 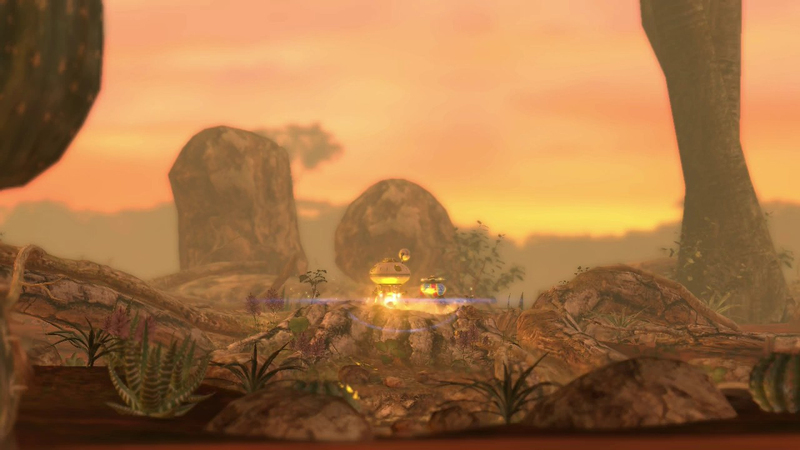 Although it possesses masterful level design, the game's overall control scheme is problematic. Pikmin 3's main gameplay was designed with the Wii Remote in mind. It is awkward and time-consuming to gather and throw Pikmin using the analog sticks on the GamePad, and after my first frustrating attempt to defeat a single airborne enemy in that manner, I switched permanently to the Wii Remote. 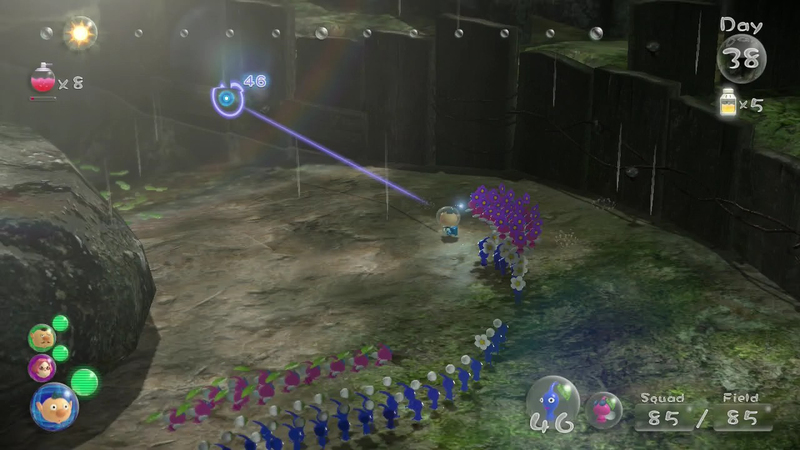 Using the Remote to gather, aim, and toss Pikmin is intuitive and effective, but the map on the GamePad's screen is invaluable during the story campaign. Thus, I found the best way to play the game was to primarily use the Wii Remote but have the GamePad balanced on the arm of my couch so I could crouch over it whenever I needed to use the map. It's a somewhat awkward setup, but at least the game instantly switches back and forth between the different control schemes as soon as the player touches either controller.